This week, I addressed a joint hearing of the Senate and House agriculture committees to discuss a relatively new, but growing threat to our state’s economic well-being and the quality of life of our citizens: the Spotted Lanternfly. When the Spotted Lanternfly was discovered in Berks County in 2014, it was the first time this invasive pest had be found in the western hemisphere. Since then, while the pest has spread to other southeastern Pennsylvania counties, we have been relatively successful in containing it. As a comparison, when the Spotted Lanternfly, which is native to southeast Asia, was found in South Korea (a country roughly the size of Pennsylvania), it had spread throughout the entire country within three years. Fortunately, that hasn’t been the case here, but the lanternfly’s prolific ability to procreate and migrate poses a considerable challenge—one that will only grow as the pest reaches new areas. Our success in the future will depend on dedicating resources commensurate with this challenge and with building on the partnerships we have at the local, state and federal levels of government, with Penn State Extension, the public, and with businesses. 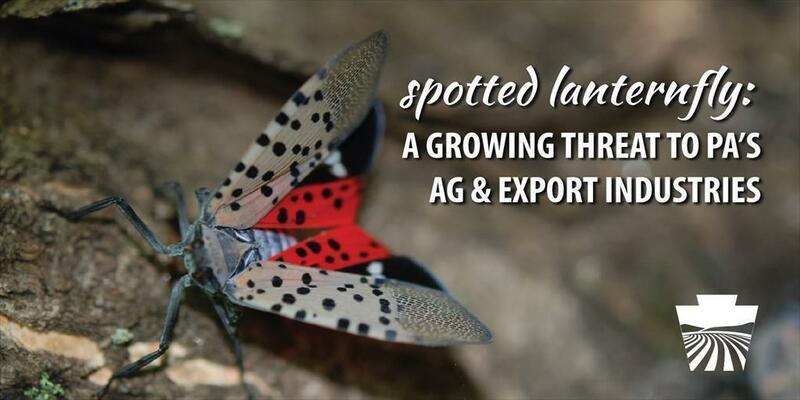 The Spotted Lanternfly threatens to destroy $18 billion-worth of Pennsylvania’s plant-based commodities. Recently, we documented these insects feeding directly on grapes and young apple trees. If the SLF were to expand into the state’s fruit belt region, it could be economically devastating. Pennsylvania ranks fourth nationally in apple production—an $80 million industry here. Adams County, alone, has apple sales of approximately $70 million. Also at risk are our nearly $17 billion forest products industry; our $944 million landscape and nursery industry; $28 million grape industry; and $19 million peach industry—among many other commodities. When the Spotted Lanternfly is discovered in a region, that area is quarantined. As the quarantine zones expand, more products risk being subjected to trade prohibitions. States and countries could refuse products from Pennsylvania, potentially costing the commonwealth $280 million in European exports alone as countries there try to keep out the Spotted Lanternfly. Fortunately, we have been spared from trade barriers, but that could all change if we do not rise to the challenge. It is becoming clear that additional resources will be necessary to support more extensive outreach and greater levels of collaboration across the state. Invasive pest threats to agriculture are nothing new for Pennsylvania. We have a history of dealing with new species that were once foreign to our state. As an example, I think back to our successful work to eradicate the Plum Pox Virus, which threatened our stone fruit industry. We’ve overcome invasive pests in the past, and I’m convinced we can do it again. But doing so will take an all-hands-on-deck approach. For the sake of our agriculture and export industries, it’s something we must do.